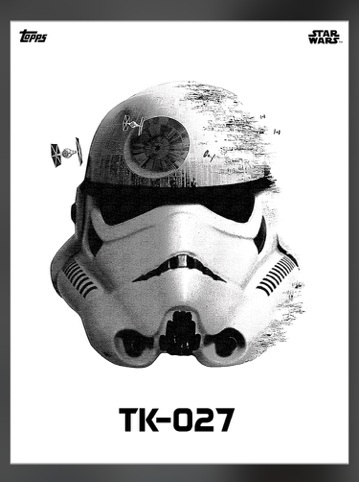 Topps Star Wars Card Trader Weekly Round-Up – News, Tips & Strategies! Just as soon as I said Badges of War hasn’t been seen in awhile, the last card drops and it was a beautiful picture of Boba Fett. But also as soon as the card dropped, fans were in an uproar over the lack of news of an Award Card. For those that do not know, if you collect all the inserts of a certain variant of a set, you typically receive an Award Card. With no news of this, fans began expressing their displeasure on social media. The very next day, it was revealed by Topps Steve and Topps Digital that there would indeed be an Award Card. Kudos to them for the great customer service and quick response time to quell upset fans. Classic Art Cards resumed this weekend and there are only a few more cards coming before Series 1 comes to a close. This weekend, it was Classic Art Dengar. The final card count for Dengar was 4,395. Less and less people are going after these cards it seems, and that may make it harder and harder for some to complete this set. Topps also brought back the Star Destroyer Pack but this time, you had to purchase credits that day to be able to open this pack. It still had a massive amount of inserts across multiple sets, but the reception was not as strong this time due to many of the same inserts still being in the sets. Many fans who didn’t get a chance at the pack the first time, were pleased however at being able to get a massive amount of inserts for very little credits. Space Paintings are back! These cards showcase the gorgeous art of Ralph McQuarrie. These cards continue to showcase the unique “hoard award” where traders who collect 10 of the Orange Variant in the first 24 hours of the card’s release, will receive an exclusive Gold Variant of the card. Be wary Collectors! While the first set of these were fairly easy to collect in trades, these seem tougher this go around, possibly because the final pull counts are considerably lower for the Orange Variants than the first series. 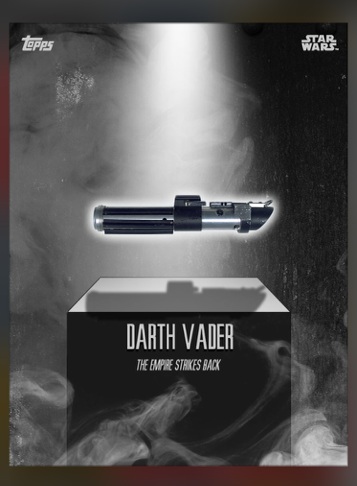 Finally, there was a mix up in the Elegant Weapons Vader card released on Sunday. The card was the same card as one that had sold out previously. 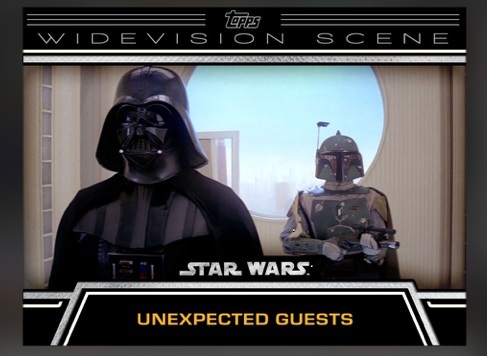 Topps realized its error and that was quickly fixed with Vader’s correct saber. Thanks to Topps for the quick action. My week was slow except for trading to firm up the cards I needed to complete the Topps Choice Marathon. I kept current with the sets I was collecting such as Storyboards and Comics for the most part, but the rest of my credits were saved for the final Topps Choice Card. 175K saved, the time comes and…I get a Widevision. While that may make most people happy, that’s not the card I wanted and couldn’t get anyone to do a 1:1 trade for it. In the end, my good buddy Andrew was able to trade for me and get me the card. My Topps Choice Marathon in finished. I just eagerly await my reward. My week last week was one for the ages. I decided to chase marathon sets. Too late in the game to go after vintage but wanted to acquire some cards just because they are cool looking. Sunday came and I pulled a Captain Rex Topps Choice. Monday saw the return of Badges. Once they hit, the rush was on. This one took some time, but after 60k in credits, I was able to pull it. Thursday saw the end of the second wave of Vintage. I haven’t been good at pulling these, but I was able to pull it fairly quickly when it went live. Later that night, and thanks to couple of Tapjoy offers, I dropped 5k on a Boba pack and pulled another Fury Luke. Last card in the pack too. Talk about suspense. Friday saw Classic art drop and Dengar was the featured character. This one cost me, and came down to the last 2 minutes before I finally pulled him. Friday night and into Saturday morning I spent most of my time setting up deals to close out what missing Wide Visions I needed. By Saturday morning before the last card dropped I was current. Once it dropped, I pulled two Wide Visions in back-to-back packs, and a third about an hour later. These are amazing cards and they really pick great scenes from the films to feature. My buddies Ron and Mark chased the McQuarrie Paintings and Storyboards. They were able to pull for me what I had missed out on the previous two days. It was a crazy week of pulling for me. I had a fantastic week (by my standards…not by Dru’s standards). The main reason for my great week was – FREEDOM! Badges of War and Manga concluded early in the week and I was able to secure both final cards due to some help from friendly trades. After that, the only set I was actively collecting was the fantastic Storyboards set which is 1:20 and thus relatively easy to pull. Having only one set to chase gave me the freedom to be stress free and go after random cards that I liked. I pulled a random silver Space Painting just because I could and promptly traded it to Mark. I pulled my first and only TK card which all of us agree is the nicest looking card of the week. I even pulled my first and only Wide Vision which was in high demand. All of these came with little to no stress because I had plenty of credits to spare, set a limit on how many times I would try for the random cards, and would have been perfectly fine if I didn’t pull them. The downside is that it can be boring when you’re not actively chasing much. But I was able to save credits, pull the Storyboards when they came out and take or leave everything else. It was a great feeling. I’m sure Topps will release a new set that I’ll have to chase but for now I’m enjoying the freedom. “My wife and I are both Star Wars fans. Met through the Star Wars CCG from Decipher back in the late 90s. After 15 years of marriage and a kid who might not understand why her middle name is Padme; our love for each other, Star Wars and collecting stuff is still going strong. What a fantastic story of shared passion and enthusiasm from a couple. It’s great to see the fun and positive impact Star Wars can have on people. This week’s tip deals with a topic most of us using the app see on a weekly basis. So, you are a couple cards short in completing a set and you want to post to the fan feed about trades. How it works is you go to the fan feed, put what you’re looking for and what you have available. It’s then posted to the feed and other users can see your message. They then can click your name and offer you a trade. If you have what they need and vice versa, you close out the deal with no issues and everyone is happy. However there are a few people out there who like to take advantage of new users, or those that skim the offer assuming the user on the other side is honest. Well, sadly that is not always the case and you get some that think they can pull a fast one. At first glance, this seems like a great deal for the person who is on the receiving end of the transaction. He’s getting some blues he probably needs, getting some series 2 base cards. Going the other way, he isn’t giving up much. Or so it seems. Major rule of thumb regarding this game/app is always know what you have and what it looks like. Bottom left corner of the give side is a Reflections Darth Vader. If any of you have chased that set, you already know how hard those cards are to pull. This is a clear cut example of someone hoping that the other isn’t paying close enough attention and trying to get over. This stuff is out there and you have to be aware. The SWCT community is full of good people. But there are always a few bad apples that spoil the bunch. Take this tip with you when you conduct or receive your next trade. There are a lot of great Traders out there on Twitter but the one that provides one of the most invaluable services is SWCT Information (@swct_info). 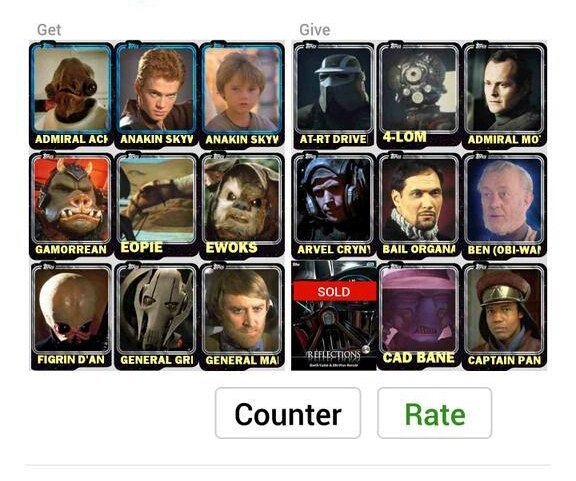 The Card Trader app is unfortunately hit or miss with the push notifications, but SWCT has their back. They will typically tweet out information minutes after Topps does, making this a great account to follow. Thanks to them for their hard work and if you find them useful, send them some base Max Rebo’s as they like to hoard them. And lastly, it appears there is an amazing hardcover book on the horizon, titled Star Wars: The Original Topps Trading Card Series Volume One. The front and backs of all 330 and 55 stickers will be reproduced in this book, and will include 4 exclusive trading cards. We haven’t seen the inside of this book yet but it appears one to watch. You can preorder it on Amazon now. Thanks for reading this week and make sure to come back next week for more!